"New research from the Pacific Institute estimates that bottled water is up to 2000 times more energy-intensive than tap water. Similarly, bottled water that requires long-distance transport is far more energy-intensive than bottled water produced and distributed locally. Indeed, when all the sums were done, it seems the annual consumption of bottled water in the U.S. in 2007 required the equivalent of between 32 and 54 million barrels of oil—roughly one-third of a percent of total U.S. primary energy consumption.The article, “Energy implications of bottled water” by researchers Peter H. Gleick and Heather Cooley, is the first peer-reviewed analysis of its kind and appears in the February 2009 edition of Environmental Research Letters.“As bottled water use continues to expand around the world, there is growing interest in the environmental, economic, and social implications of that use, including concerns about waste generation, proper use of groundwater, hydrologic effects on local surface and groundwater, economic costs, and more. But a key concern is how much energy is required to produce and use bottled water,” said article co-author Peter Gleick, president of the Pacific Institute. “It turns out the answer is, a lot.”The authors note that a single estimate of the energy footprint of bottled water is not possible due to differences among water sources, bottling processes, transportation costs, and other factors. Gleick and Cooley calculate the energy requirements for various stages in bottled water production, including the energy to manufacture the plastic bottles, process the water and the bottles, and transport and cool the final product. Combining the energy intensities for these stages, the analysis finds that producing bottled water requires between 5.6 and 10.2MJ per liter—as much as 2000 times the energy cost of producing tap water. 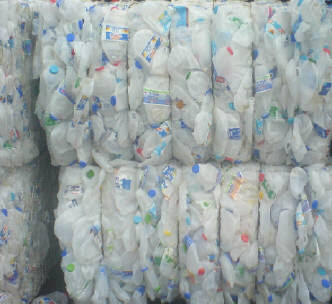 The authors further estimate that to satisfy global demands, the energy equivalent of 50 million barrels of oil per year is used just to produce the bottles, primarily made of PET plastic, almost all of which are currently made from virgin, not recycled, material. “With the U.S. consumption of bottled water exceeding 33 billion liters a year, and with intensifying efforts to reduce energy use and greenhouse gas emissions, these data should help identify ways to reduce the energy costs of bottled water and may help consumers themselves make more environmentally sustainable choices,” said co-author Heather Cooley, senior research associate at the Pacific Institute. Based in Oakland, California, the Pacific Institute is a nonpartisan research institute that works to create a healthier planet and sustainable communities. Through interdisciplinary research and partnering with stakeholders, the Institute produces solutions that advance environmental protection, economic development, and social equity—in California, nationally, and internationally.